The American Legion presented a check for $3,600 to the Honor Flight veterans to cover the cost of the monthly breakfast for the next year. Members of the American Legion attended the Tehachapi Monthly Veterans Breakfast on March 23 and presented a check for $3,600 to cover the cost of breakfasts for the next year. Monthly breakfasts are held at 9 a.m. at St. Malachy Catholic Church, 407 W. E St. Veterans are invited to come eat for free, and spouses and guests cost $5. 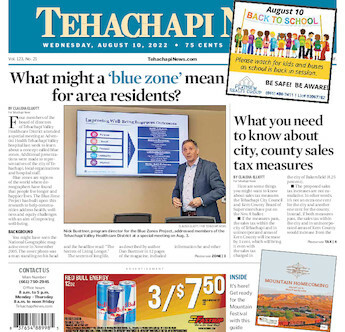 For more information, contact Pam or Tom Stenson, Tehachapi Outreach, at 823-1036.